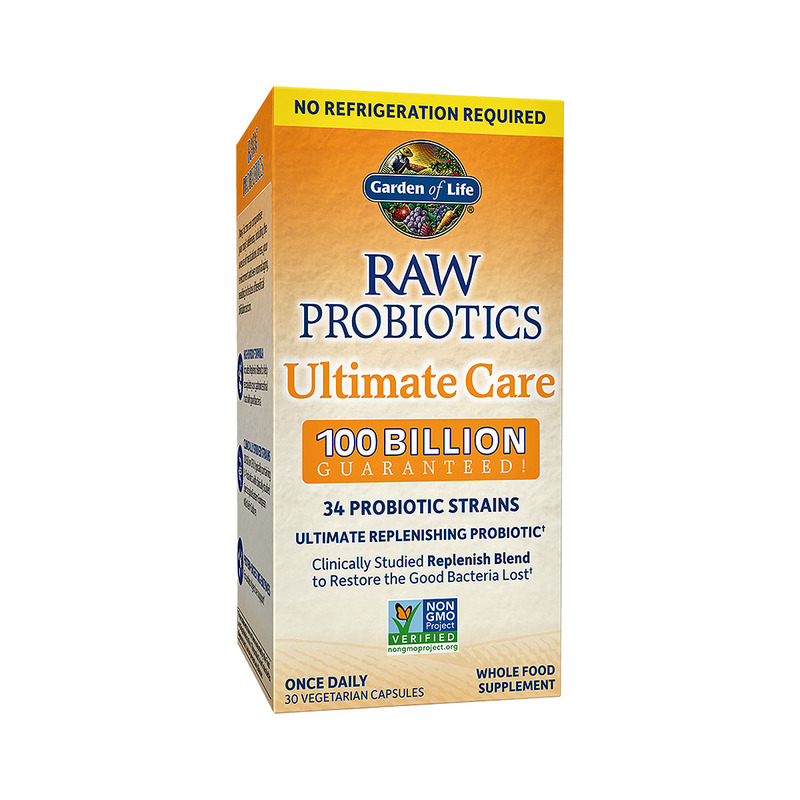 Garden of Life RAW Probiotics Ultimate Care is the ultimate probiotic supplement! Specially formulated to help repopulate your digestive tract with beneficial health promoting bacteria. 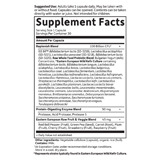 Its high Bifido formula includes the clinically studied Replenish Blend, Bulgarian Yogurt Concentrate, and Eastern European Wild Kefir Culture. With 34 distinct probiotic strains and an astounding 100 billion CFU's per capsule - it's by far the most powerful, targeted, and comprehensive probiotic supplement available! 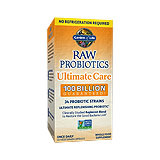 Garden of Life RAW Probiotics Ultimate Care is the ultimate complementary probiotic. Many factors can compromise your body's defenses, including the overuse of medications, stress, your environment and even normal aging, resulting in the loss of beneficial Bifidobacterium. Ultimate Care's high Bifido formula includes the clinically studied Replenish Blend, making it your ultimate complementary probiotic to achieve balance - helping you repopulate your gastrointestinal tract with good bacteria. RAW means our probiotics are uncooked, untreated, unadulterated, with no binders or fillers and no carriers. 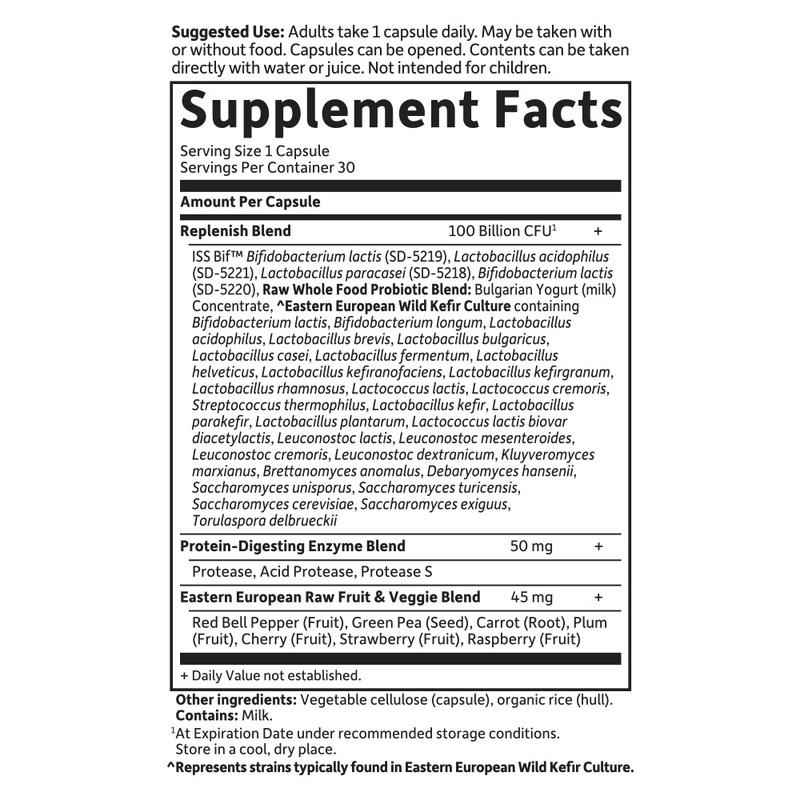 What we promise on the label is what you get - 100 billion live probiotic cultures in a convenient once-daily capsule. Our Shelf Stable, patent-pending desiccant-lined bottle technology ensures your probiotics Arrive Alive! 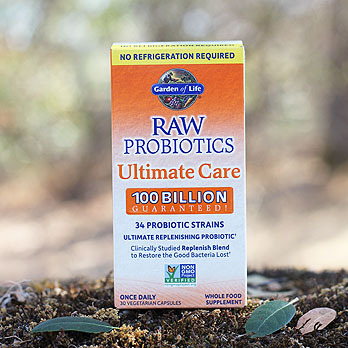 Unlike isolated strains of probiotics, RAW Probiotics Ultimate Care offers all the benefits of a true "food" probiotic with a record-setting 34 probiotic strains. So, it's not just isolated bacteria in a pill; Ultimate Care is a whole-food probiotic that emulates eating fermented food. Made with mainly Bulgarian yogurt concentrate, Wild European kefir grains and SCOBY's (Symbiotic Culture of friendly Bacteria & Yeast), and concentrated clinically studied probiotics strains, RAW Probiotics Ultimate Care is created below 40° F and 30% humidity so that what you see on the label is what you get in the bottle. Suggested Use: Adults take 1 capsule daily. May be taken with or without food. Capsules can be opened. Contents can be taken directly with water or juice. Not intended for children.